How much can a judge infringe on the rights of a person accused, but not yet convicted, of a crime? According to a divided Washington State Supreme Court, that line is drawn in urine. The state's high court examined three 2015 DUI cases from Spokane County, and in a 5-4 decision, ruled that judges can restrict people from consuming drugs and alcohol, but cannot require "suspicionless urinalysis testing" to ensure compliance. In 2015, Chris Cooper, Cortney Blomstrom and Brooke Button were charged in separate cases with driving under the influence. Neither Cooper nor Blomstrom had been convicted of a DUI or any drug- or alcohol-related offense, according to court documents. Button, whose 2015 charge involved suspicion of marijuana intoxication, was convicted of a DUI in 2009 in Idaho, court records show. In each case, Spokane County District Court Judge Greg Tripp, who recently retired, imposed random monthly urinalysis testing as a condition of release before trial. The state Supreme Court says that condition is too intrusive for people who are considered innocent in the eyes of the law and is a violation of state Constitution's guarantee of privacy. "The state seeks to minimize the import of suspicionless urinalysis testing by concluding that the testing itself is a 'limited incursion.' This characterization is surprising. On the contrary, 'it is difficult to imagine an affair more private than the passing of urine ... "Most people describe it by euphemisms if they talk about it at all. It is a function traditionally performed without public observation; indeed, its performance in public is generally prohibited by law as well as social custom.'" However, four of the justices disagree that random piss tests are too onerous a condition for those accused of crimes. Justice Steven Gonzalez, who wrote the dissenting opinion, argues that judges must have discretion to impose the random testing to ensure public safety. "When imposing conditions, judges should consider, among other factors, the defendant's criminal record and the nature of the charge," Gonzalez writes. "However, in one fell swoop, the majority removes a judge's ability to impose release conditions on DUI defendants." Part of the disagreement among the justices is whether a DUI should be considered a violent offense, and whether someone accused of a DUI is likely to drive drunk again. The majority argues that a DUI is not a violent offense. Gonzalez put it this way: "A court has authority to impose pretrial release conditions that protest the public from new DUI's, i.e. violent crime, because probable cause for DUI is evidence that the defendant may reoffend." For his part, Judge Tripp explained his rationale for requiring random urine tests by citing a National Highway Traffic Safety Administration study provided by prosecutors, which found that someone with a blood alcohol content more than 0.15 is "fa[r] more likely to be involved in a fatal car crash as well as more likely to reoffend," according to court documents. 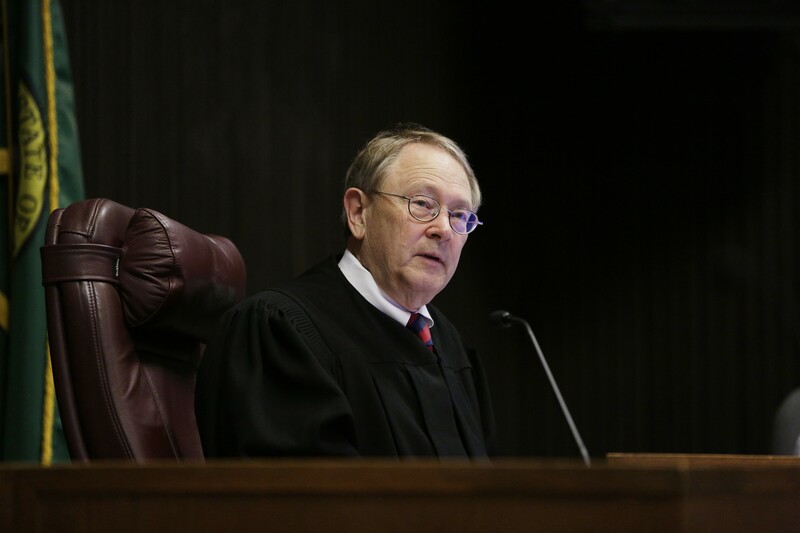 Current Spokane District Court Judge Aimee Maurer says the Supreme Court's "powerful decision ... underscores the fact that just because someone is accused doesn't mean they are guilty, and doesn't mean that person's rights — especially at pretrial — evaporate."